Let's start near the beginning of the initial report. It is confirmed by Sylvester Stallone himself that he is in fact directing and starring in another Rambo film and it will begin production in Spring of 2010. On Friday Harry over at AICN broke news that in turn made the online community believe that "Rambo V: The Savage Hunt" would be essentially Rambo vs. Universal Solider. Harry gloated that he spoke with Stallone and that Sly was planning a much different take on Rambo. One that could initially force some to become uncomfortable with. The idea is that John Rambo and a 22 year old hunter partner Beau Brady are hired along with a team of highly trained Special Forces unit to track down a U.S. Military created killer in the Pacific Northwest. Harry described them as, "brilliantly instinctual killer soldiers that have no qualms about taking life." Bloggers and major movie news site began to run with Rambo V being something similar to Predator or Universal Soldier and as a result Stallone got on the phone and left a detailed voice message for Harry clearing up any mistaken reports on exactly what "Rambo V: The Savage Hunt" will be. Stallone said, "It's not Universal Soldier. It's not me fighting some super soldier. It's actually a feral beast, it's a thing." 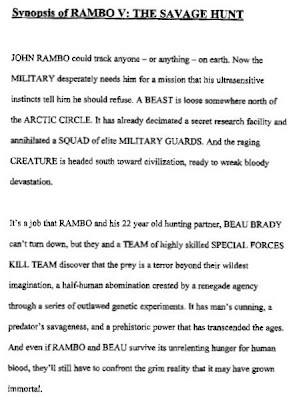 So thankfully we can definitely put to rest the idea that Rambo V will be anything of a Rambo vs. Universal Soldier. Stallone went on in his message to explain the beast itself. He said, "Its a malformation of fury and intelligence and pure unadulterated rage. Its before men became human. This is when they are still in-human." 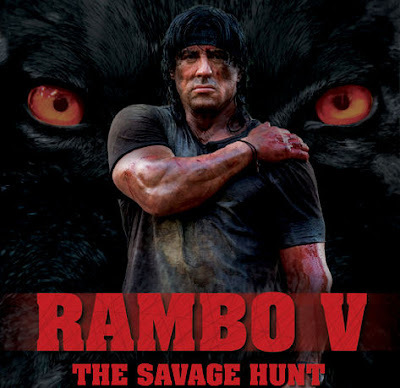 Stallone describing a beast that is highly intelligent and yet utterly vicious is no doubt enticing, but I still have a ton of fears about the direction "Rambo V: The Savage Hunt" is taking. Stallone added a bit more on confronting the savage beast. He exclaimed, "What he confronts is something that is everyone's virtual nightmare. Its like man's conscious fighting his dark, dangerous, uncontrollable subconscious. Very similar to the plot in Forbidden Planet." Uh, okay. I see Stallone's ideas fine, just for me, I'm definitely remaining a bit hesitant about the concepts.